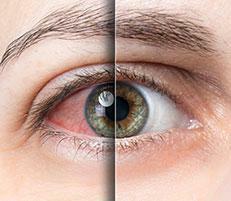 There are many custom sophisticated contact lens options available to you. 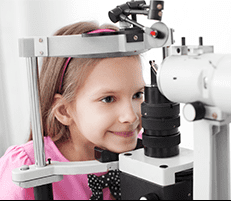 Your initial visit consists of a medical exam, corneal topography, digital slit lamp imaging, and a specialty contact lens fitting. We utilize modern contact lens designs and fitting techniques with an ultra-high speed, high resolution scanner to achieve the best design possible for your eyes. 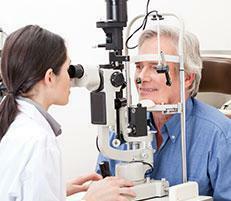 In order to achieve an appropriate fit, your appointments will be longer than the traditional eye examination. 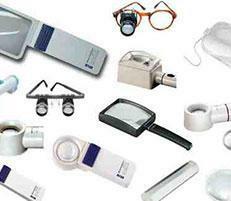 Several adjustments of your lenses to optimize your fit should be expected. 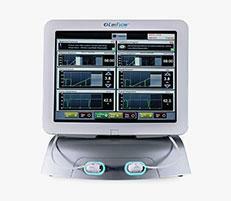 The Eaglet-Eye ESP offers more features than any previous profiler. Our revolutionary topographer is the first to offer profiling, not only of the cornea, but also right across the limbus and over a large portion of the sclera. 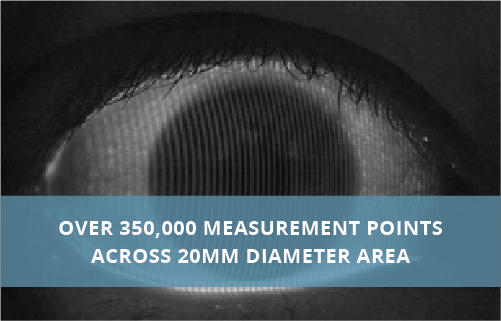 But it isn’t just the unprecedented 20mm diameter of measurement that’s causing such excitement in the world of optometry. 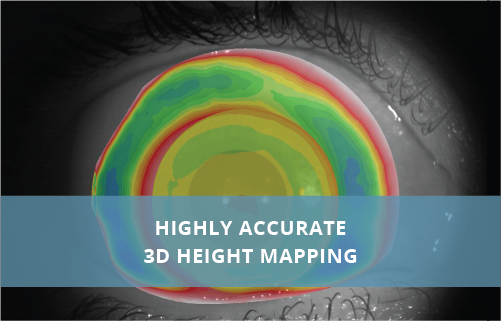 The measuring accuracy of the ESP is such that practitioners can now generate 3D ‘height maps’ of the eye’s surface in astonishing detail. 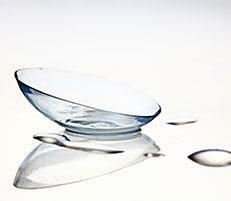 Gas permeable lenses are made of a non-pliable breathable material that retain their shape on the eye. 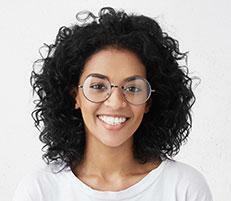 This unique feature allows the contacts to replace the irregular surface of the eye with a smooth, uniform surface to achieve improved vision over soft contact lenses and eye glasses. 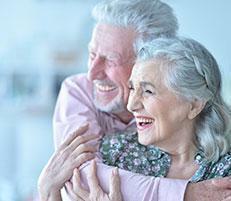 Occasionally a technique called “piggybacking” may be used to improve comfort. 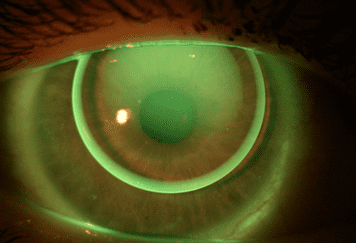 This technique utilizes a soft contact lens on the cornea to cushion the gas permeable lens. 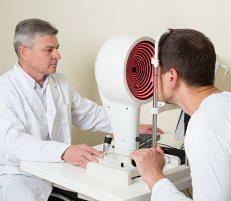 Your doctors are highly trained in different designs for an optimal fit. The green glow is dye to visualize proper fitting of gas permeable lens. 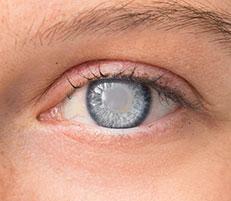 Hybrid contact lenses are a technological breakthrough that combines two types of contact lens materials – a rigid gas permeable center and a soft lens skirt- into one unique lens. The soft skirt provides all-day comfort and the rigid center delivers superior optics to improve your visual experience. SynergEyes lenses are the first FDA cleared hybrid contact lenses specifically designed for keratoconus vision correction. 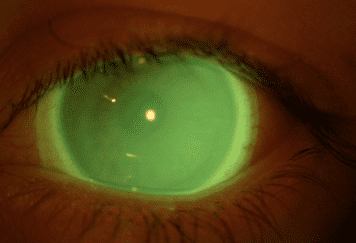 The green glow is dye to visualize proper fitting of hybrid contact lenses. Scleral contact lenses are a custom designed larger diameter lens that vaults over the cornea and rests on the less sensitive white sclera. 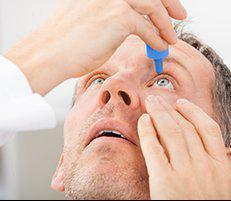 The unique design allows the vaulted section to be filled with a fluid reservoir which acts as a liquid bandage to help treat extremely dry or diseased corneas. This unique feature makes this device a Prosthetic Replacement of the Ocular Surface Ecosystem (PROSE). 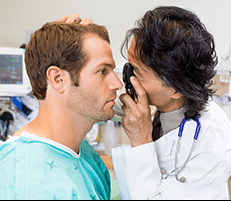 Scleral lenses may be used to improve vision and reduce pain and light sensitivity for people suffering from a growing number of disorders. 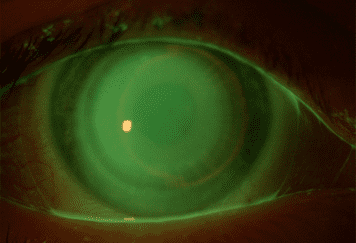 The green glow is dye to demonstrate where the fluid is under the scleral prosthetic lens.